Gunki THG FV Reels are a distillation of the very latest technologies to produce two top quality models with very precise gearing for ultra-smooth winding that you will appreciate particularly when playing hard fighting fish. Very light and compact Gunki have selected a carbon composite material for the body and rotor as it offers the best balance between weight and strength. The reel handle is screwed directly into the command gear and eliminates any risk of play when winding and adds extra cranking power when playing large fish. Multi disk micrometric drag system is protected by a waterproof seal so it stays running smoothly no matter what the weather. The integrated infinite anti-reverse and aluminium spools with a shallow and the long cast lip designed for a more fluid line transit over the spool lip for better casting performance. 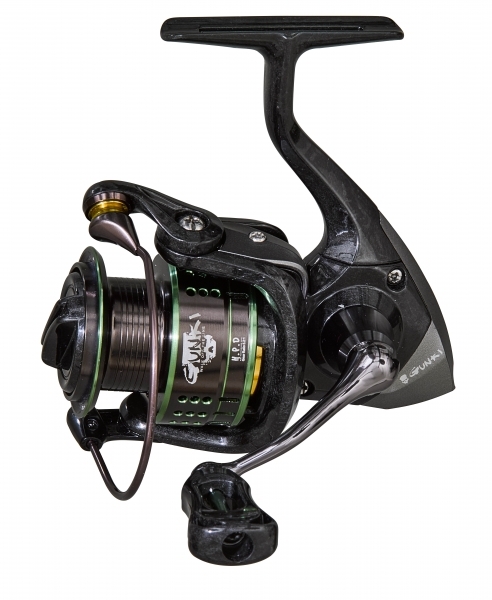 Naturally the reels have an Ultra-S curve cross spiral oscillation system with an oversized titanium line guide with anti-spin technology and with a Drag power of 4kg for the THG FV 1500 and 7kg for the THG FV 2500 these reels really is top of its class. These high end reels really are the business. Gunki THG FV Reel 1000 - Model 61249 - New for 2018. 60cm retrieve per turn of the handle. 65cm retrieve per turn of the handle. 73cm retrieve per turn of the handle.